Deepen your knowledge of crystals, gemstones, and rocks, and learn how to put their power to work for you. Crystals Beyond Beginners helps you draw upon your foundation of crystal work to improve your skills and take the next steps in your personal practice. 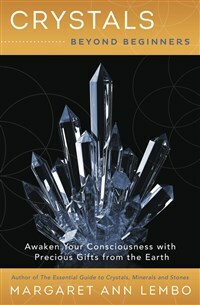 Through exercises, affirmations, and in-depth guidance, Crystals Beyond Beginners teaches you how to fully incorporate crystals into your daily life and unlock your greatest potential. Margaret Ann Lembo is the author of Chakra Awakening; The Essential Guide to Crystals, Minerals and Stones; The Angels & Gemstone Guardians Cards; Color Your Life with Crystals; and seven spoken audio CDs. She is the creator of a line of award-winning Aroma-Energetic Sprays, including Smudge in Spray™ and the seven Chakra Sprays. She is a spiritual entrepreneur and practitioner, aromatherapist, and the owner of The Crystal Garden—a book store, gift store, and spiritual center in southeast Florida.